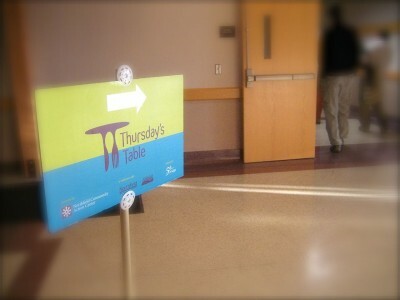 A free meal program called Thursday’s Table is attracting high numbers of guests as the economy worsens. There is plenty to go around now, but Northfield Community Action Center administrators are wondering what might happen if many more poeple begin to show up. Click play to listen. Two minutes. Or download the MP3. Also see Griff Wigley’s post on the Northfield Community Action Center’s program when it first began. Update 10/18 CORRECTION: Thursday’s Table begins at 5 p.m. and lasts until 6:30. 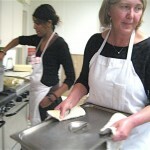 Linda Petricka (foreground) and Nardos Tesfalidet volunteer as cooks for Thursday's Table this week. When we started Thursday’s Table, we based our plans on the experiences in other towns, some larger than Northfield. The expectation was that 50-75 people would attend weekly, ramping up to 100, or so, when word got around. We started with over 150 per week right away and it has now grown to nearly 200 weekly. The CAC is doing a fantastic job, and the community has been very generous with volunteer time and with financial support. Thanks to everyone and especially to Jim, Judy Bickel, Mimi Trevino and all of the volunteers who help with Thursday’s Table! I hope that anyone who has an opportunity to support this program will do so. I also want to highlight the contributions of Hannah Puczko and all of the volunteers and staff of the School District’s Community Services Division. Every week they have been providing special programming for the children of Thursday’s Table guests. Hannah’s work and that of others was recognized this week with an award from the MN Community Education Association. Way to go Hannah, Jim, Judy, Mimi and everyone else who is working every week on Thursday’s Table!